Considerado precursor del cine documental boliviano, y como uno de los principales cineastas de ese país. Nace en Sucre, y luego de filmar varios cortometrajes de temática agrícola, comenzó su trabajo en la distribuidora Bolivian Films, cuyo propietario patrocinó la primera película sonora de Bolivia, Virgen india (1948) codirigida por Ruiz y su amigo Augusto Roca. En 1953, filma la antropológica Vuelve Sebastiana, sin duda su obra cumbre, comparable con la célebre Nanook el esquimal, clásica obra documental de Robert Flaherty. Narra la sencilla historia de una niña Chipaya, y se convirtió en la obra más significativa del cine boliviano, galardonada en numerosos festivales. Así, Ruiz se ganó el título de "padre del cine indigenista andino". En 1958, uno de los grandes fundadores del cine documental en Europa, el escocés John Grierson afirmó que Jorge Ruiz era "uno de los seis documentalistas más importantes del mundo". Fue Director del Instituto Cinematográfico Boliviano de 1957 a 1960. Entre 1962 a 1983 vivió en Chile, Colombia, Guatemala, Ecuador y Nueva York donde realizó numerosos trabajos y fundó Cine 70 en Perú. Tuvo varias realizaciones independientes con productoras internacionales como la BBC de Londres, la CBS y la NBC, de Estados Unidos, o Televisión Española, entre otras. En 2001, recibe el Premio Nacional de Cultura, máximo galardón entregado por el Estado Boliviano y dos años después, en el 2003 el Festival de Cine Iberoamericano de Huelva le brinda un homenaje en reconocimiento a su obra cinematográfica fundacional, y de alto relieve cultural. Jorge Ruiz (1924 -) was born in Sucre, Bolivia. He is considered a precursor of the documentary film in Bolivia and one of the most important filmmakers of that country. After filming several short films of agricultural theme, he began working for the distributor Bolivian Films, whose owner sponsored the first sound film in Bolivia, Virgen india (1948) co-directed by Ruiz and his friend Augusto Roca. In 1953, he makes the anthropological film Vuelve Sebastiana, undoubtedly his masterpiece, which can be paired to the famous Nanook the eskimo, the classical documentary by Robert Flaherty. It tells the ordinary story of a Chipaya girl, and it became the most significant film of the Bolivian cinema, awarded in numerous film festivals. Thus, Ruiz won the title of “Father of the Andean Indigenous cinema”. In 1958, one of the most outstanding founders of the documentary cinema in Europe, the Scotsman John Grierson, stated that Jorge Ruiz was “one of the six most important documentary filmmakers of the world". 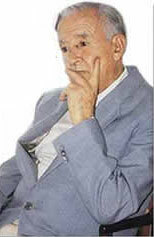 Between 1957 and 1960, he was the director of the Film Institute of Bolivia (Instituto Cinematográfico Boliviano). From 1962 and 1983, he lived in Chile, Colombia, Guatemala, Ecuador and New York where he made several works and founded Cine 70 in Peru. He made a number of independent productions with international production companies such as the BBC of London, CBS and NBC, from the United States, or Televisión Española, among others. In 2001, he was awarded the National Prize of Culture, the highest award given by the Bolivian State and two years later, in 2003 the Iberian-American Film Festival of Huelva (Festival de Cine Iberianoamericano de Huelva) pays tribute to his foundational and emphatically cultural film work.